More troubling video of workers at a New Jersey Montessori school has surfaced after an NBC 4 New York report showing cellphone video of an aide aggressively handling a 23-month-old girl led to the firing of three teachers and two school officials. The new video, taken by another witness after NBC 4 New York's exclusive report Wednesday, shows an employee at the Apple Montessori School in Hoboken grabbing a crying child by her feet and holding onto them while she yells, "Stop. Stop it right now." She then yanks the small child up, swings her over the fence by her arms and marches the wailing girl back into the building, nearly dragging her by the arm. After being shown the new video by NBC 4 New York Thursday, a spokeswoman for the school confirmed the woman was one of the five employees who were fired but had no further comment on the video, which was taken May 13. New video obtained by NBC 4 New York Thursday shows another worker at the Apple Montessori School in Hoboken roughly handling a toddler. This video was taken by another witness after NBC 4 New York's exclusive report on another video showing another worker acting aggressively with a small child. Five employees have been fired, the school says. The person who shot the video told NBC 4 New York she had observed workers getting increasingly rough with the kids over a period of time. She was cleaning a window in an apartment above the play area when she filmed the incident on May 13, intending to show it to her mother and ask for her opinion. The tipster, who asked to remain anonymous, said she never showed it to the school because she had no ties to the school and didn't know how to approach anyone with the video. On Wednesday, another woman with a similar vantage point in the building, shared her own cellphone video of a teacher's aide at the school grabbing a 23-month-old girl and roughly attempting to put a hat on her had. 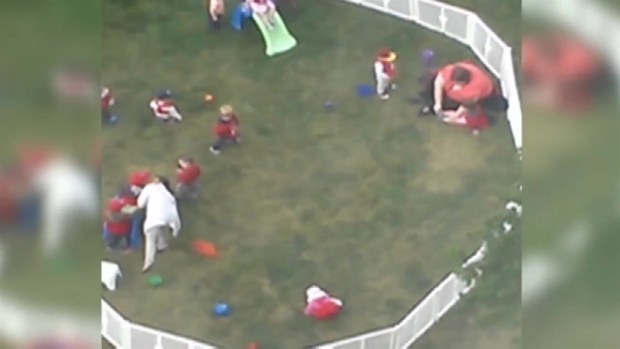 Clearly exasperated, the woman aggressively picks up the child and pushes her to the ground, finally leaving her lying there as other children play around her. Apple Montessori said in a statement Thursday it was "deeply troubled by the behavior of the former staffer." The school said it didn't see that video, which was also shot in May, until Wednesday, and took immediate action to remove the aide from the classroom. The director and assistant director of the Hoboken location, who had the video last week, also were fired "for their mishandling of this incredibly serious situation," the school said, along with a teacher and another teacher's aide who were present at the time the video was captured. The child in the initial video is Brett Stenhouse's daughter. He saw the video for the first time when it was shown to him by NBC 4 New York, and was shaken but said the little girl is OK.
"It was really disturbing," said Stenhouse. "We're being told that there had been an incident. I didn't expect it to be as severe as it actually was." Stenhouse also learned of the video Wednesday. He pulled his daughter from the school Thursday. The person who shot that first video wrote to NBC 4 New York, saying she showed it to the school director last week and was told the teacher would be placed on working probation for 30 days, meaning she would be able to remain on site and working. After that conversation, she feared the school wouldn't notify parents, so she posted the video on Facebook. A local parenting group reposted it, and parents of children outside the school were equally horrified, with some saying that they were sick to their stomachs. The family that runs the Apple Montessori Schools sent a letter to parents Wednesday, saying in part, "We are outraged by the lack of care and concern this employee showed. We do not condone this type of behavior in any way, shape or form." The school added that it runs background checks on employees. Kyle Lanphear used to send his children to Apple Montessori's location in Cliffside Park. He says he pulled his daughter out of the school when her teacher abruptly left and the teacher who replaced her "didn't even have a bachelor's degree." "She wouldn't be able to work in any classroom in America, but she can teach my kindergartener," Lanphear said. The I-Team has learned schools like Apple Montessori are not licensed child care centers. They are not subject to strict state regulations that require teachers to meet minimum standards, nor are they subject to laws requiring criminal background checks for all child care workers. According to the New Jersey Department of Children and Families, the Apple Montessori schools are considered programs operated by private schools run solely for educational purposes. The agency says the school is only required to follow rules set by a board of directors. "Should they be allowed to police themselves?" asked Cecilia Zalkind, executive director of Advocates for Children of New Jersey which works on state, local and federal levels to implement changes to benefit children in the Garden State. "If a program is licensed they are under the authority of the state DCF. There should be reporting to parents when something happens." Apple Montessori said in a statement it was implementing new safety measures to ensure "this type of incident doesn't happen again." As for the fact that it's not a licensed day care, a spokesperson said only: "We are run like a school."